materials: acrylic crochet yarn medium size and 4mm crochet hook. for big size with 64 chains. Row 1: 1 single crochet into the 2nd chain from hook, 1 single crochet in each of next 4 stitches, *3 single crochet into the next, 1 single crochet in each of next 5 stitches, skip 2, 1 single crochet in each of next 5 stitches*, repeat from * to * until the end of row. Row 2: working on back loops only. Chain 1,turn. Skip 1st stitch, *1 single crochet in each of next 5 stitches, 3 single crochet to the next, 1 single crochet in each of next 5 stitches, skip 2* repeat across from* to * until 6 stitches. 1 single crochet in each of 4 stitches, skip 1, 1 single crochet in the last stitch into both loops. Row 3 – Row 47 : repeat row 2. *You can sew a fabric inside but it is not necessary. Row 1: 1 single crochet into the 2nd chain from hook, 1 single crochet in each chain across. Row 2: chain 1, turn, 1 single crochet in each stitch across. *Join the sides with the back with single crochet stitch. Start from the end of V.
*You can add a chain for handle and sew a magnetic button. 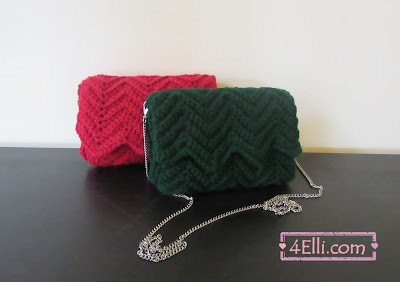 You can watch our video tutorial witch shows you how to make this beautiful ripple stitch bag step by step.